Additionally, it is possible to implicitly cast using as. Property lists are collection of AnyObjects. NSUserDefaults are a way to store property lists persistently between launchings. A short demo shows how to use property lists in the calculator app. UIViews are rectangular areas with a coordinate system for drawing and handling touch events. They are structured hierachically having a superview and subviews and a UIWindow at the very top. Additionally awakeFromNib is called when a view is generated via a storyboard. The origin of the coordinate system is in the upper left corner. Its units are points with a varying number of pixels (contentScaleFactor) depending on the used device. frame defines the view in the super view, the view itself is defined by its bounds. Colors are handled using UIColor which even allows transparency using alpha values (don’t forget to set opaque to false). Setting the hidden property of a view to true removes the view and its sub views completely from the screen. … or you can create them using core graphics (see UIGraphicsBeginImageContext). UIViewContentMode defines what should happen when the bounds of a view changes. It could just been placed somewhere – .Left/.Right/.Top/.Bottom/.TopRight/.TopLeft/.BottomRight/.BottomLeft/.Center – scaled – .ScaleToFill/.ScaleAspectFill/.ScaleAspectFit – or redrawn – .Redraw. The demo at the end of the lecture shows parts of the just learned theory. The lecture and its slides are available via iTunes named “5. 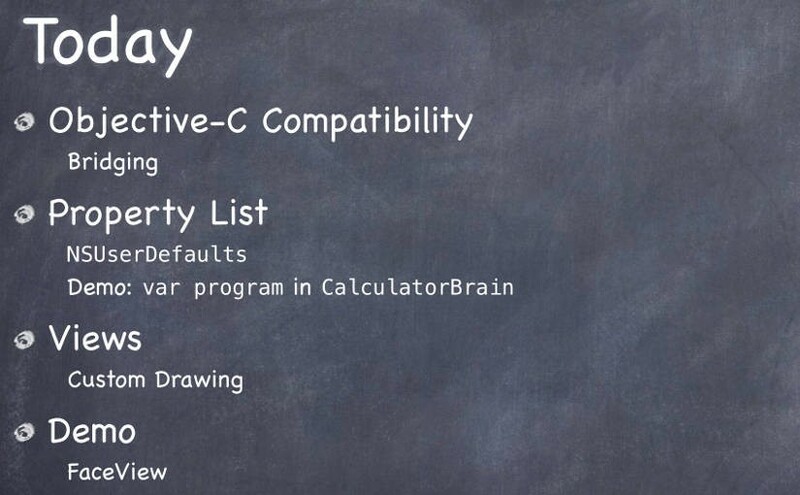 Objective-C Compatibility, Property List, Views”. The code for the calculator demo is available on GitHub. The code for the happiness demo is available on GitHub and Stanford.